In 1887, Adolf Cluss and his partner, Paul Schulze, designed this duplex for Henry Horatio Wells, Jr. It was one of the last residences designed by Cluss and Schulze. Born in Michigan, Henry Wells Jr. and his mother and sister settled in Alexandria, Virginia, during the Civil War, where Henry Wells Sr. served as Provost Marshall for the Union Army. After the senior Wells served two years as the military Reconstruction governor of Virginia, President Grant appointed him U.S. Attorney for Eastern Virginia and his twenty-two year old son, H.H. Wells Jr. Assistant U.S. Attorney. In 1875, Grant appointed both men to the same positions for the District of Columbia. In 1879, the father and son resigned to start a Washington law firm. Cluss and Schulze designed the duplex at 428-430 M Street for the Henry Wells, Jr. family. Although Wells and his wife died in the early 1890s, some of their four children continued living at 428 M Street until 1909. The duplex at 428-430 M Street is the only extant residential building designed by Adolf Cluss. 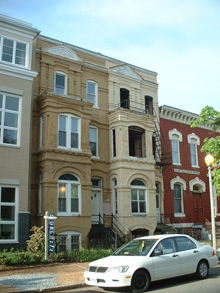 The house of Henry Wells, Sr. (not designed by Cluss), 901 M Street NW, also survives.